Child maltreatment, which includes both child abuse and child neglect, is a major social problem. 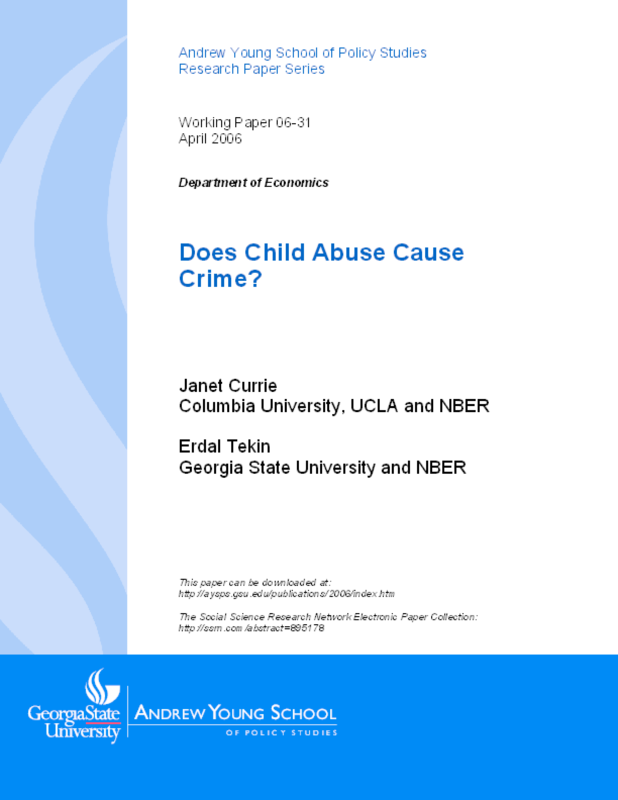 This paper focuses on measuring the effects of child maltreatment on crime using data from the National Longitudinal Study of Adolescent Health (Add Health). We focus on crime because it is one of the most socially costly potential outcomes of maltreatment, and because the proposed mechanisms linking maltreatment and crime are relatively well elucidated in the literature. Our work addresses many limitations of the existing literature on child maltreatment. First, we use a large national sample, and investigate different types of abuse in a similar framework. Second, we pay careful attention to identifying the causal impact of abuse, by using a variety of statistical methods that make differing assumptions. These methods include: Ordinary Least Squares (OLS), propensity score matching estimators, and twin fixed effects. Finally, we examine the extent to which the effects of maltreatment vary with socio-economic status (SES), gender, and the severity of the maltreatment. Title: Does Child Abuse Cause Crime?